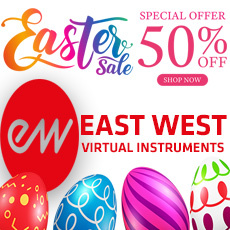 East West is having an Easter Sale until April 25th. A 9-foot, American Concert Grand. We went through 12 Steinway D’s before finding this gem. This is probably the most balanced universal piano in the collection. The dynamic range is huge, from a whisper to thunder. The Silver Edition allows users to purchase a single license for one Piano from the East West QL Pianos. PLAY interface includes impulses from the same hall the producers used to record Symphonic Orchestra and Symphonic Choirs so the pianos can blend with those collections. The QL Pianos were produced by Doug Rogers and Nick Phoenix, the same production team that produced the multi-award winning EastWest QL Symphonic Orchestra and EastWest QL Symphonic Choirs. With the original library, all 4 pianos were included. Single Piano from the famous Galaxy II K4 Piano collection. - 32-bit standalone and plug-in versions included. - 64-bit PC VST (host must support 64-bit VST plugins) and standalone versions included. - Check the following compatibility chart for availability of other 64-bit versions and updates. All included instruments, information and specifications are subject to change without notice.